This is the last part of the series on using the Exchange Server Role Requirements Calculator. This document analyzes the result pane on the Exchange Server Role Requirements Calculator. This results page provides a detailed layout model of database distribution in the database availability group (DAG). It shows the total number of databases hosted on each server running the active databases. You can simulate this environment with one or more server failures in both datacenters, and simulate site failures as well, to better understand the minimum databases available with the maximum number of server failures. Active Directory (AD) site with a single or multiple-DAG environment: Configure the witness server in the primary datacenter where you have majority of the nodes. Multi-AD site with a single or multiple DAG environment: Install the witness server in a third datacenter. The requirement is to have the network well connected to all three datacenters. The third datacenter should not have any network failure that can affect the DAG in the other two datacenters. Based on the inputs provided on the input sheet, the Calculator generates a configuration script and support comma-separated-value (CSV) files. PowerShell scripts use these configuration files to create and configure database and database copies. 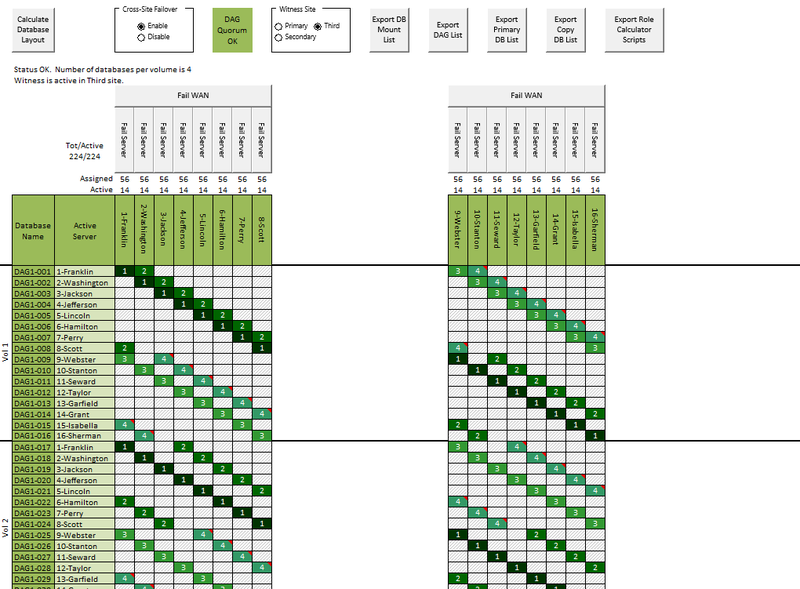 The following table describes details about the scripts. Diskpart.ps1 Configures the physical disk system and mount points defined in the servers.csv file. CreateDAG.ps1 Creates and configures DAG by reading the DAGInfo.csv file. The DAGInfo.csv input file contains the necessary configuration information such as DAG name, witness server, witness path, DAG nodes, and GC information. CreateMBDatabases.ps1 Creates all the active mailbox databases, with the preference of one. It uses the MailboxDatabases.csv file as the input to the script for creating the databases. CreateMBDatabaseCopies.ps1 Creates the mailbox database copies for all the active databases created using the CreateMBDatabases.ps1 script. It reads the MailboxDatabaseCopies.csv file and configures the database copies accordingly. This pane provides volume storage architecture guidelines. The recommended architecture is multiple copies of DBs. This pane suggests the number of databases per volume with the recommended database + log volume and server architecture. Multiple DBs per volume instances allow you to use AutoReseed. AutoReseed restores database redundancy automatically following an issue that necessitates a reseed of a database copy, such as a disk failure or database corruption event, by using spare disks that have been provisioned on the system. One LUN for multiple databases. This traditional architecture isolates databases from the logs. It provides the flexibility for backup/restore and better performanJBOD Storage Architecturece, since the spindle is different for the database and logs. This architecture is Microsoft’s recommended model for Exchange Server 2013 and later to make the best storage utilization of low-cost SATA disks by having multiple databases/LUNs. It also allows the advantage of auto reseeding when there is a disk failure, and to reseed the failed database automatically. 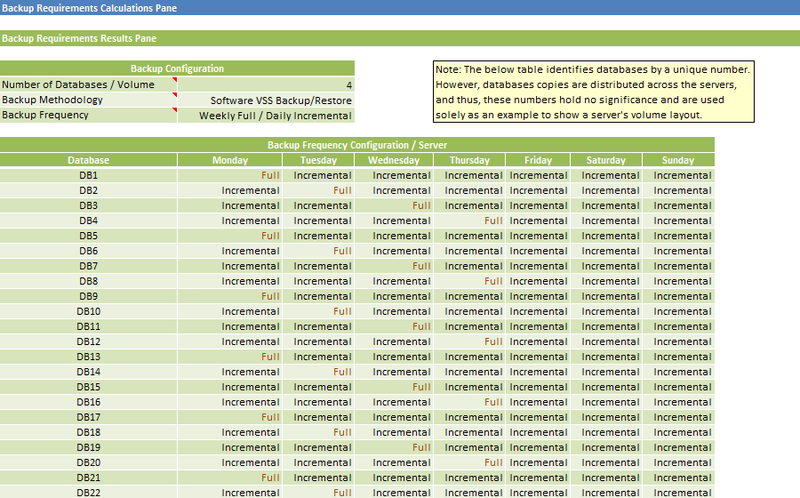 This pane shows the recommended backup methodology and frequency for Exchange database backups. Because you can have a large number (up to 100) of mailbox databases in each server, with a very large DB size, it would be impossible to perform a full backup every day. Consequently, it is recommended to perform weekly full and daily incremental backups. Full and incremental backups also purge transaction logs. Mailbox modeling helps to predict the time when mailboxes will reach their maximum limits. This helps you plan for additional storage. In the following example, it would take approximately 22.31 months to reach the 10 GB limit with 100% retention. This pane helps you analyze the network throughput requirements for replicating the transaction logs and content index for each database to the secondary database. It specifies the network throughput for logs and content index required/database based on the design model, each DAG, and the complete environment. The recommended value ensures you will have the necessary throughput to prevent the replication lag from affecting availability if a failover occurs for a single database, the DAG, or the complete environment — including both lagged and non-lagged databases replicated to the alternate datacenter. RPO Log and Content Index Replication Throughput Requirements specify how delayed you will allow log shipping to get. The lower the RPO (0 or 1) value, the higher the bandwidth. The higher the RPO (up to 24), the less bandwidth is required. Also, shown is the RPO network throughput for log and content index required/database based on the design model, for each DAG, and for the complete environment — including both lagged and non-lagged databases replicated to the alternate datacenter. Administrators can select the architecture that suits his needs. For the given type of disk in the calculator, RAID storage architecture recommends RAID 1/0, with the given disk for the database + logs and RAID 5 for the restore volumes. The calculator also specifies the number of disks required for each RAID configuration for the databases at both datacenters. Just a Bunch of Disks (JBOD) is another recommended storage solution. The calculator uses the given type and speed of disk from the input worksheet and suggests the number of disks needed for database + logs, restore, and AutoReseed volumes. Microsoft recommends JBOD with multiple DB/volume. You might also need to configure AutoReseeding to reseed the failed databases into new spare disks if a disk failure occurs. The calculator also recommends the total number of disks needed for each mailbox server, each DAG, and the total environment. This helps you predict the number of disks required for the complete environment for procurement and budgeting purposes. These result panes provide detailed design configuration information. Designs may need some tuning before they are considered to be final. After the design is finalized, you might need to perform hardware and perform testing using tools such as Loadgen and JetStress disk to ensure you achieve the necessary performance from the server hardware. If you do not obtain the required performance, revise the input values in the calculator to tweak the design and rerun the tests until you achieve the desired results. After all the testing has been performed, the design solution can be implemented in the organization.